Adaptive structures are of increasing interest in industrial applications since their mechanical properties can be adjusted to external conditions. However, their use in safety relevant areas (e.g. aerospace and automotive products) requires techniques of non destructive testing for condition monitoring of the structure. In order to keep the inspection time short, NDT-methods are preferred that show defects only. This is achieved by using methods that respond selectively to damage specific properties like hysteresis / friction or "clapping" when exciting the piezoceramic actuator with a low voltage ac-signal. These localised nonlinearities are detected with a scanning laser vibrometer. Local mechanical losses due to hysteretic processes are imaged with an infrared camera system which is tuned to the amplitude modulation of the excitation (" LockIn-Thermography"). This modulation allows to determine depths of defects while it ignores static temperature gradients which could cause misinterpretations of the image. We will present experimental results obtained on various kinds of structures with embedded and surface-bonded actuators where we applied these new methods y for selective damage detection. Non destructive testing (NDT) of fibre reinforced polymer components is being investigated intensively due to the increasing importance of these materials in safety-relevant areas. However, the process of actuator embedding and the characterisation of the active/adaptive structure were investigated rarely. Potential reasons are the small achievable amplitudes provided by piezoceramic actuators as well as the complexity of the structure. The high number of boundary surfaces in samples with integrated actuators is a challenge to existing NDT methods because one has to distinguish between defect- induced and intrinsic boundaries. The resulting question is whether the established NDT methods are applicable to active structures or how well they can be optimised according to the new requirements. On the other hand NDT methods specialised for smart structures may utilise the integrated actuator for excitation or detection of elastic waves or vibrations. In any case the broad variety of adaptive structures may require a corresponding variety of non destructive testing methods which are based on different principles so that the information on efficiency and safe operation of the inspected component is obtained. In the first step before the production of the structure, the efficiency of the actuators must be checked and characterised. Thereafter the embedding process in autoclaves should be monitored to detect deviations during the process. The finished structure must be inspected with respect to its efficiency and already developed damage. A permanent or intermittent examination of the reliable function during the period of operation (" health monitoring") is necessary for quality control. After fast integral methods have detected the presence of a defect, in a next step it must be characterised and also localised. For this reason imaging procedures are necessary. The simplest test of active structures containing piezoceramic actuators is based on the use of the actuator also as a sensor . As an electrical excitation always results in a mechanical deformation, the measurement of the electrical small signal transfer function shows also the mechanical characteristics. Therefore this is a way to detect damage of the actuators or the structure is detected integrally.The transfer function is measured at a constant amplitude of the excitation voltage based on the assumption of linearity. To measure the electrical transfer function, an alternating voltage of variable frequency is applied to the sample while the generated current is monitored by an impedance analyser with respect to magnitude and phase. The electrical behaviour of a piezoceramic actuator corresponds to that of a lossy capacitor whose impedance decreases with increasing frequency (ZC=(iw C)-1). The phase of impedance stays nearly frequency-independently at -90° . As the magnitude of impedance changes with frequency by several orders of magnitude it is moremeaningful to monitor the phase as it deviates only slightly from -90° except at resonances. At these frequencies more energy is transfered so that the ceramic is no more a purely imaginary load. A damage affects the mechanical and/or the electrical characteristics of a resonance (e.g. by reduction of thestructure stiffness). A short-circuit causes a decrease of the phase of impedance to low frequencies while a reduction of capacity is due to cracks of the ceramic material. Cracks, closed delaminations or plastic deformations which induce a hysteretic behaviour enhance the damping of individual resonances and shift them to lower frequencies due to the related loss in stiffness. The integral modification of the vibration spectrum can be used to monitor the embedding process of integrated actuators or also the increasing losses of power transmission due to damage in the actuator-structure interface. A special sample has been designed to simulate these conditions: The environment of the actuator consisted of thermoplastic material whose elasticity could be controlled by a built-in heating wire . The phase spectra (Figure 1) show the variation of the mechanical properties during the change of temperature. As expected, the losses increase on the average with rising temperature, which can be seen both by the decrease of phase and by the increasing damping of most resonances. This effect is stronger at higher frequencies since more hysteresis cycles are generated per unit time so that energy dissipation is enhanced. The function x(f,t) represents the phase spectrum at room temperature and y(f,t) the spectra under heated conditions. The sample used for these measurements consists of four independent piezoceramic actuators ACX QP20N (A to D), which are embedded in a CFRP-structure (width 153 mm, length 300 mm). Actuator C shows a deviation in its phase angle to higher frequencies due to a damage of its insulation layer.This defect enhances the capacity of the actuator. In combination with the (output) resistance of the amplifier and the connection wires this capacity caused a low-pass-filter behaviour stronger than that of the other actuators. 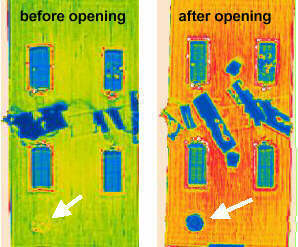 LockIn thermography is an active method which uses sources of heat whose amplitude is sinusoidally modulated. Therefore the heat transport within the material has characteristics like a wave (" thermal wave"). An infrared camera monitors the temperature at the surface during several modulation cycles. At each pixel in the sequence of the thermographic images a computer applies a Fourier transformation to the time dependence of temperature so that local magnitude and phase image are obtained. The magnitude image shows the temperature amplitude at the surface and the phase image the depth where the modulated heat source (the area with modulated loss-angle heating) is located . In order to detect spots of increased mechanical and electrical loss angle with a high sensitivity, the actuator of the sample is excited with the highest possible amplitude and frequency in order to maxi mise the hysteresis area per unit time. By a low-frequency modulation of the excitation amplitude the spots where friction, plastic deformation etc. occur become sources of thermal waves . As the actuator is electrically active this applies also to the electrical losses (short-circuits, dielectric losses etc.) as another heating source. Figure 4 shows the LockIn phase image of the sample where each of the embedded four actuators is excited separately with a voltage of 20 Vpp at a frequency of 41 kHz. The LockIn modulation frequency was 0.03 Hz. The image with excitation of actuator C shows clearly an area of enhanced dielectric losses due to the additional capacity at the edge of the actuator. If the sample is exposed to an intensity modulated light beam thermal waves are generated by light absorption in the surface from where they propagate into the sample to be reflected at internal discontinuities. The phase angle at the surface is changed by the superposition of the incoming and reflected waves. For the investigation of the sample the surface was illuminated by halogen lamps with an amplitude modulation of 0.06 Hz. The phase image provided by Fourier transformation is shown in Figure 5. The sample was provided with two artificial delaminations in the laminate which are both revealed (white arrows). The plastic spacers around the actuators and the conductive stripes on the actuator surfaces are detected as well. The application of ultrasound for raster imaging requires a liquid or gaseous coupling medium between the transducer and the sample in order to allow for relative motion of the probe with respect to the acoustic beam. As elastic waves are reflected at boundaries between media depending on the difference of acoustic impedances (defined by the product of density and sound velocity), water is used almost exclusively for coupling (" impedance match"). Therefore the losses are small and the water will not transfer any shear waves so that for perpendicular incidence of the sound wave one can be assume longitudinal waves in the sample. However, the disadvantage of water coupling is that water sensitive materials cannot be examined and that water penetrates into cavities. Another problem is the high proportion of ions in the water which can cause corrosion. Corresponding to the normal environment of the samples air does not produce these problems. However, both the speed of sound and the density of air are much below the corresponding values of the probes and the test material. As the resulting reflexion losses are high, one needs much more acoustic energy in order to obtain a signal with a good signal-to-noise ratio. The following sound transmission C-scans of the sample (Figure 6) were performed with burst signals of 450 kHz and an excitation voltage of 1kV. During the first measurement (left) the delaminations showed up only very weakly. As the artificial delamination was produced by two Teflon foils it was obvious that they had stuck together during the autoclave process. To separate them the sample was bent with support at the position of the delamination. The repeated measurement (on the right) shows the resulting separation of the foils. The Teflon foils on the top side of actuator B were not loaded in order to avoid damage of the actuator. It should be mentioned that the thermographic investigations were already performed before opening, where both delaminations could already be proven (Figure 5). The difference of sensitivity to the degree of delamination might be caused by the difference in phonon wavelengths involved in thermal and ultrasound inspection. The signals structures between the actuators are caused by electrical links and adhesive stripes. The measurement of the transfer function (as described in the first paragraph) makes the simplifying assumption that the response of the system scales linear with the excitation. This results in the amplitude- independent transfer function. However, in a real sample there are processes which do not fulfil this criterion: Apart from the intrinsic material nonlinearity (by asymmetry in the process of the bonding potentials and plasticity) e.g. friction is a non-linear (and hence amplitude-dependent) form of energy conversion  which cannot be described by a loss angle (deviation from 90° phase angle of the admittance). Delaminations can likewise cause not Hooke-like behaviour since in this case only pressure but no strain will be transferred . Bending load toward near-surface delamination will cause a buckling of the membrane which closes with back swings whereby the two surfaces "clap" together. The original sinusoidal excitation becomes rectified . After performing a Fourier transformation of this distorted oscillation one finds integral multiples of the fundamental frequency (" overtones", "harmonics") . To detect local nonlinearities a natural frequency would be unfavourable since one needs a homogeneous detection sensitivity over the entire sample. So there is no standing wave pattern and no directivity of the elastic wave field. At the spot of nonlinearity (like at any other spot) waves of the excitation frequency come in from all directions - but in this particular spot they are deformed. Because of the amplitude dependence at nonlinear areas there is no independent superposition of the waves any more. Instead there is a convolution effect which generates harmonics with a propagation speed of zero of the statistically distributed directions of the excitation waves. Thus harmonics are localised oscillations for an idealised case [10,11]. In practice these ideal conditions are not given so that also harmonics spread out. This allows also for the integral detection of overtones. For imaging of local nonlinearities a scanning laser-vibrometer (Polytec PSV 200) monitors the spectrum at each pixel on the sample surface. By using the level of a certain overtone for imaging contrast the areas of nonlinear behaviour (thus potential defects) appear selectively (Figure 7) . The overtones mark the delaminated area clearly only after it has been opened. If one compares the spectra determined at the undamaged and damaged area the level differences of the harmonics (about 15 dB) become clear. The second and third harmonics at the area of the delamination have a higher level than in the intact environment (about factor 10). The excitation of actuator C (nearest to delamination) was performed with a voltage amplitude of 15 VRMS with 40 kHz. IDNThe results obtained on smart structures provided with defects indicate that impedance spectroscopy combined with correlation analysis is a powerful tool for integral monitoring of gradual changes while overtone spectroscopy reveals non-linear defects integrally. With spatially resolved techniques based on elastic or thermal waves one finds areas of delamination where the sensitivity of thermal waves is obviously higher. Using the non-linear or hysteresis effects related with defects one can even perform defect-selective imaging which allows for rapid identification in condition-monitoring of safety-relevant structures. The authors are grateful to the Deutsche Forschungsgemeinschaft (DFG collaborative research centre SFB 409) and the state of Baden-Württemberg for supporting this work. Also the efficient collaboration with Polytec GmbH is highly appreciated. The sample in Figure 3 to Figure 7 was kindly provided by J. Dürr (DaimlerChrysler Aerospace Dornier GmbH). Nixdorf, K.; Busse, G.: Electrical Impedance Spectroscopy for Cure Monitoring and Damage Detection in Model Adaptive Components. ADAMES, Proceedings of the Euromech 373 Colloquium Modelling and Control of Adaptive Mechanical Structures, Magdeburg 1998, pp. 57- 66.